The National and International Fellowships Office (NIFO) helps high-achieving students envision future paths and identify relevant fellowship and scholarship opportunities, apply and integrate their disciplinary knowledge and experiential learning in a competitive application, and embark on future opportunities with confidence and purpose as they move toward their long-term goals. What are National and International Fellowships? National and international fellowships provide financial awards to exceptional undergraduate students and recent graduates who are interested in pursuing graduate study, carrying out internships, conducting research or teaching abroad. Typically funded by government grants or private foundations, such fellowships confer financial awards along with other possible benefits, including international prestige, preferential admission to graduate schools, leadership training, opportunities for international exchange and access to networks of individuals who share ambitious goals. 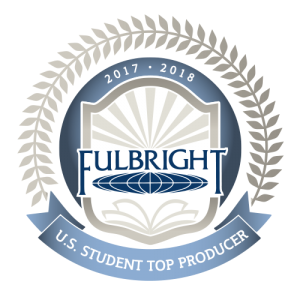 In recent years, Elon students have been successful in a number of prestigious national fellowship competitions, including those for the Truman Scholarship, Mitchell Scholarship, Goldwater Scholarship, Rotary Ambassadorial Scholarship, National Science Foundation Graduate Research Fellowship and the Fulbright U.S. Student Grants. Omolayo Ojo '15 received a Boren Scholarship to study Wolof in Senegal. In this video she discusses her experience working with the National and International Fellowships Office (NIFO) at Elon to compete for this award. Omolayo later went on to receive a Fulbright English Teaching Assistantship in France.